Weber Shandwick helped the cookie reinforce its rebranding to young consumers who were unaware of the name change. DEERFIELD, IL: Three years ago, Fig Newtons rebranded as Newtons and added various fruit flavors to its product lineup. Yet many consumers are still unaware the treat underwent a name change. To solve that problem, the brand teamed with Weber Shandwick to build buzz with an original Web series targeting young consumers. Weber started working with the Mondelez International brand last December, helping it create a comedy called Now We're Newtons. Launched on Monday, the mockumentary describes a company transitioning from "all fig, all the time" to "not just fig anymore." "Newtons has not done a Web series before, so we decided to bring them this Office-esque Web series about a not-so-comfortable transition from figs leading the company to all sorts of fruits," said Jim Paul, MD and executive creative director at Weber. "We thought it would be a humorous, attention-getting angle, but would also drive home this point that Newtons is changing." He added that the firm was initially contracted to help Newtons build awareness for its in-store partnership with hunger-relief charity Feeding America. However, Paul’s team thought Newtons’ campaign for the nonprofit, called A Lot of Fruit to Give, was also an opportunity to tell its own story. 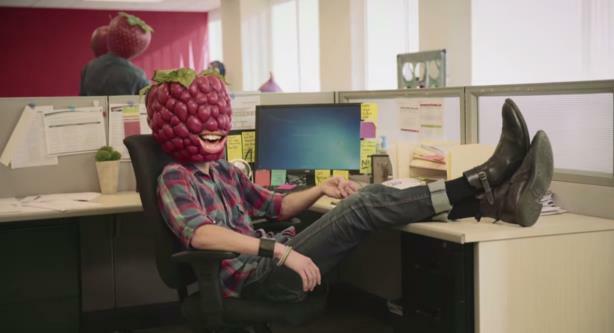 In the series, "frumans" – people with heads made of fruit – join together to devise a plan to get consumers to fight hunger and participate in the A Lot of Fruit to Give campaign. The partnership, started in February, will run through the end of this year or until a donation goal of $150,000 is met, whichever comes first. Previously, Newtons used TV and print ads to promote the cookies to Boomers, but was not active on social media, according to Gary Osifchin, Mondelez portfolio lead for biscuits in North America. Yet consumers still referred to the product by its old name. "This is our first bold foray into speaking more directly via video assets in social [media] to a younger consumer," he explained. "We are going to actively work to engage with consumers as they see the video." Osifchin added that the company will also communicate that Newtons are made with whole grains and real fruit and no longer contain high-fructose corn syrup, because healthier ingredients are more appealing to younger consumers. The brand has posted a trailer and three episodes of Now We're Newtons to its YouTube channel. New episodes are not planned, Osifchin said. Production company Pet Gorilla produced and directed the series. "This is an example of Mondelez trying something new and brave with an established brand that is more than 100 years old," he added. A team of 10 from Weber is working on the campaign. Paul is leading the firm’s creative team, and EVP Lauren Danis is heading the overall Newtons account staff. The Interpublic Group firm also works with Mondelez brands Honey Maid, Ritz, and Oreo. The campaign’s budget was not disclosed.